It is officially summer!!! Woo Hoo! School is out and both my boys are on trips this week so it is time for my hubby and I to have a staycation at home. We wanted to go away for a few days, but there is something so fun about staying home, just the two of us. I am sooooooo looking forward to it. Check my Instastories to see more!!! It's all about stripes and this adorable straw bag today on the blog. 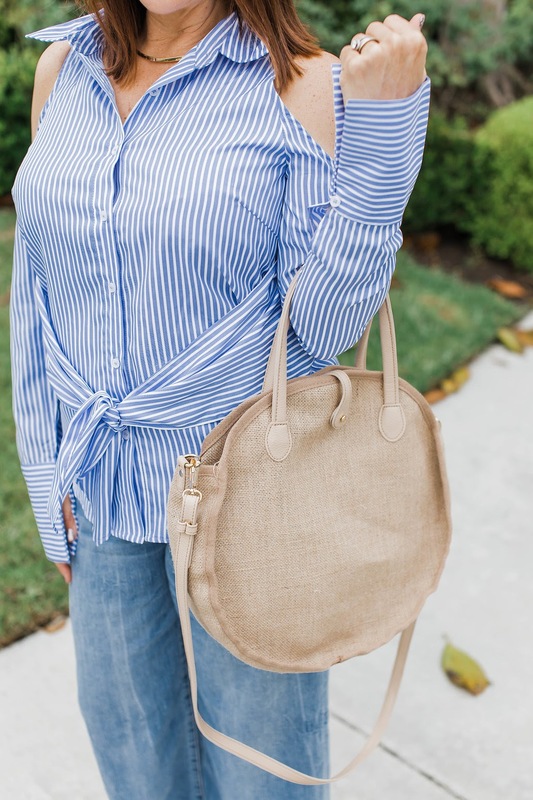 I cannot get enough of the cold shoulder trend right now and adding some stripes brightens up this look. How cute is the front tie on this shirt? And I am loving the straw bag trend right now. There are so many different shapes and sizes of these adorable bags. I found this one at Target and knew I had to have it. I love how versatile it is. 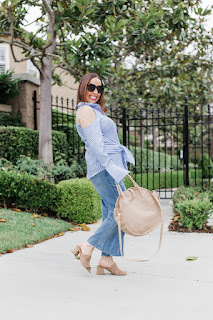 All I needed to complete this look was some frayed hem jeans and my new favorite mules and I was ready to start my day. What are your favorite summer bag styles? I would love to hear in the comments. Thanks to Gabi Wells for photos. You can shop this look by clicking on the links above. Happy Reading!!! !